Dogs Trust marks a monumental milestone for their Education team as they have successfully provided education workshops to 417,960 children and adults atross Ireland. The Education team has designed two age-specific programmes which offer free workshops, teaching children and adults about Responsible Dog Ownership and safety around dogs, in a fun and interactive way. The dedicated Education and Community team have delivered over 13,500 workshops across the country since the programme launched, reaching 95% of Ireland. Whilst 82% of Irish parents say they teach their child how to behave around a dog, over 96% don’t know there are 21+ signs that a dog may be feeling uncomfortable or stressed. 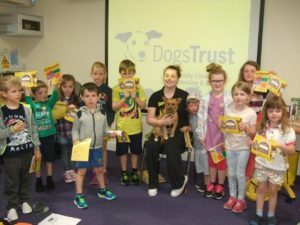 Every year, the team are busy promoting the message of responsible dog ownership throughout various educational events both in the rehoming centre at Dogs Trust and across the country. The first annual event of the year is ‘Tea & Tales’, where Dogs Trust invites various speakers to teach the audience about responsible dog ownership and careers with dogs. Another event explores how dogs’ senses work, which is very aptly named ‘Doggy Detectives’. Halloween can be quite a scary time of year for our four legged friends, with this in mind, the Education team at Dogs Trust host ‘Howl-o-ween’ to teach kids how to stay safe and keep their dogs safe at this time of year. Each year, Dogs Trust release online resources to allow all the Jessica Fetchers and Sherlock bones out there to take part in science week whilst learning about responsible dog ownership through fun interactive investigations. The team end the year with an all-time favourite event ‘Santa Paws’, where families are invited to the centre to meet the man himself. During their trip they are thought that “a dog is for life, not just for Christmas®”, a phrase coined by the charity almost 40 years ago, and why it’s not a good idea to put a dog on their Christmas list. Attendees also make stockings for the dogs that will be spending Christmas in the centre. It is always a fun filled day for all involved! Dogs Trust launched ‘The Big Scoop’ last week, over 124 schools signed up for their educational packs and our Education and Community Officers visited some of these participating schools educating over 28,500 children about the importance of cleaning up after their dog through a three tier approach towards dog fouling – ‘Law, Health Implications and the People it can affect. There are currently 148 dogs and puppies in Dogs Trust Rehoming Centre, awaiting their forever homes.